With over 20 years of experience in painter training, it's no surprise that the IWRC has worked with The Sherwin-Williams Company many times over the years. 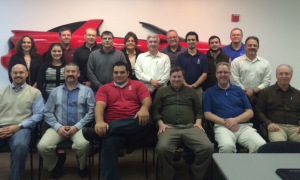 Recently, VirtualPaint staff traveled down to the Sherwin-Williams Training Center in Texas to be part of a pilot training event. Held December 8-10, Sherwin-Williams employees from all over the country had the opportunity to get hands-on training with the VirtualPaint. 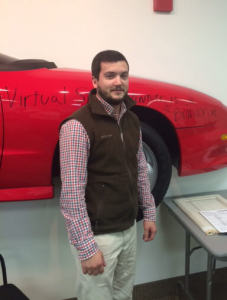 Jeremiah Treloar, VirtualPaint Program Manager, conducted the training. "We had an interactive presentation that combined the traditional PowerPoint presentations with VirtualPaint exercises," he explains. The training focused on core skills of spray technique including distance, angle, overlap and speed. Following the training, a skill competition was held. Scores were based 80% on achieving target film thickness and 20% on transfer efficiency. Congratulations to the winner, pictured to the left! "The class was great. It scored a 4.88 out of 5 on the survey that was filled out by all the participants. We thought the tool [VirtualPaint] was very valuable and we would love to have and use it with our customers as a value add," says Paul Kowalik, Global Director Of Sales Force Effectiveness at The Sherwin-Williams Company.